It is no ordinary doll, but a FULLY HANDSEWN, thread after thread, in and out from body to costume, from head to toe. 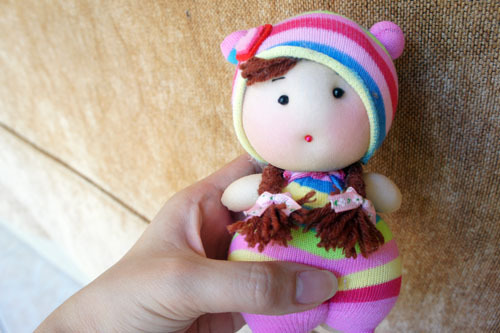 An exclusively handmade made from little more than fabric and yarn, so full of love of the doll maker. Doll play helps to enrich the inner child’s imagination. She will do a soft and sweet companion to a little girl, always a child’s best friend. Lilian happens to be a friend of mine, and I was told she made dolls as a hobby ever since she was young. She makes dolls only in her free time at night as she has a profession in teaching during daytime. She said making dolls help her to de-stress. It is her childhood dream of becoming a professional dolls maker. Until today, she had authored 3 craft books. 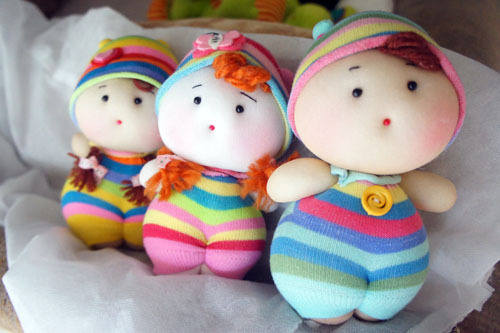 Besides making dolls to sell to friends, Lilian also do craft-related projects to raise fund for Segamat flood relief, for Japan tsunami relief , for schools, for temples and for children activities.